Falling Behind and Running Out of Time. Compared to last week, GFS and ECMWF runs this week have been much drier in Southern California, with most of the activity focused on the Pacific Northwest. No significant rain is forecast here next week, and both the 6-10 and 8-14 day forecasts project below average precipitation for Southern California. Recent runs of the GFS show the East Asian jet pumping up a huge, high amplitude ridge in the central Pacific around the dateline, but the resulting downstream trough, jet energy and storm track are forecast to remain above about 40°N. Model performance has not been the best in recent weeks, and generally suffers during seasonal transitions. However, if the 12z GFS forecast is on the mark, March rainfall for Downtown Los Angeles (USC) would fall well below the 3.14 inch norm. Since normal April rainfall is 0.83 inches, and May only 0.31 inches, beyond March it becomes increasingly unlikely that a big rain event will significantly boost our rainfall total. 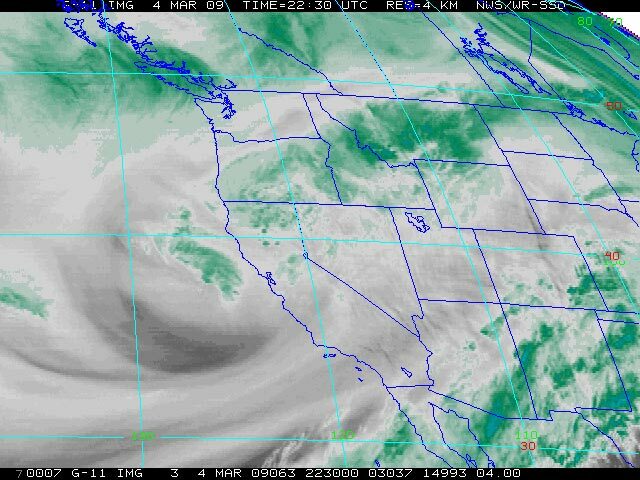 Since November 1, Downtown Los Angeles has recorded 8.80 inches of precipitation. This is consistent with the mean November-March precipitation for coastal Southern California during 9 La Niña events from 1948 to the present. 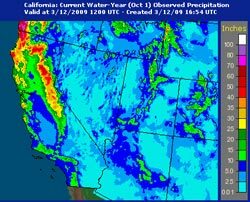 (See the composite precipitation map in Weathernotes for October 31, 2008.) The water year total for Los Angeles is now 3.32 inches below normal. 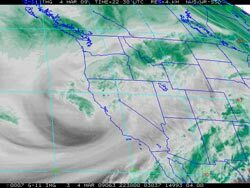 More information concerning Southern California weather can be found using our WEATHER LINKS page. Rain Season Isn't Over Until It's Over. The precipitation total for Downtown Los Angeles (USC) for February was a little above normal, but not enough to offset January's dry weather. We started out March with a water year rainfall total about 2.4 inches below normal, and as of today we're about 2.73 inches behind. Tuesday's frontal passages helped a little. Here's a GOES-11 water vapor image from 2:30 in the afternoon, and an Intellicast.com composite radar image from 2:45 p.m. Downtown Los Angeles (USC) recorded 0.25 inch of rain for the storm, and rainfall totals generally ranged from about 0.25 to 0.50 inch. Here is an archived copy of a NWS Public Information Statement listing some rainfall totals. It looks like our rain season may not be over. Recent runs of the GFS have been hinting at some rain in the 8-10 day timeframe, with a series of systems following. This is consistent with Ed Berry's Atmospheric Insights post today. In response to increased subtropical westerly wind flow, he suggests the possibility of an extended East Asian jet in the week 2-3 timeframe, with possible western USA impacts. We'll see!